I had recently written a post about the importance of understanding mark schemes and shared a tip about how to help students realise the importance of knowing the requirements of a paper (see Memorable Mark Schemes). I know that I am often guilty not spending as much time discussing assessment objectives as I should, and as a result, ‘teaching mark schemes’ takes of the role of neglected cousin to ‘teaching content’. 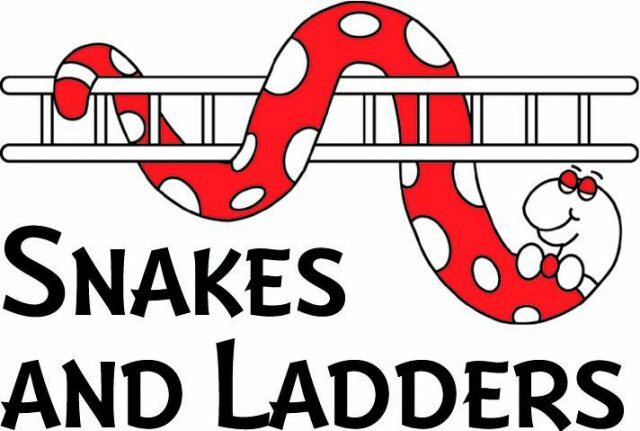 So, to make sure due attention is paid to exploring mark schemes, and to defuse their high-stakes, judgemental nature, it can be very effective (and fun) to combine them with a good ol’ fashioned board game; Snakes and Ladders. Getting students to make board games based on the topics they are studying is always an engaging ways to explore the key points of any topic (highs/lows in a character’s journey, pros and cons of living in a certain historical period) and the same applies to students’ understanding of what they should/shouldn’t do in an exam. Students simply need to identify positive exam strategies based on examiners advice or criteria for certain bands. These can then be written in squares at the base of each ladder. Equally, they identify common problems that restrict them from achieving higher levels and place these at the head of the snake. Other squares can be populated with other rewards and consequences where they move forward a number of squares or miss a go. You can even create different ‘editions’ of the game, such as the ‘Level 5 Version’ where they focus just on the criteria needed for that specific level, or the ‘A* Version’, where all positives lead students to top grades. Of course the reward can then be in the playing of the game with students leaping to the top of the board after landing on squares telling them “Well done, you have successfully identified the author’s intent”, ‘Congratulations, you have offered a counterpoint to the debate” and ‘Fabulous, you have provided at least 3 examples to support the argument’. Equally they head back towards the start when they land on squares where they are told “Oh dear, you have incorrectly labelled the diagram” or “What a shame, you have not linked you point with a theoretical perspective”. With luck, some of these key routes to success will start to become embedded in students’ minds and even more so perhaps if they design and play them prior to an assessment. Of course, Snakes and Ladders is not the only board game this works with and part of the fun can be in students manipulating other board games or even inventing their own. If you do want to try it out you can try using the following Snakes and Ladders Template. A motivating discussion is definitely worth comment. I do think that you ought to write more about this subject matter, it might not be a taboo matter but generally folks don’t talk about such issues. To the next! Best wishes!! Next time I read a blog, I hope that it doesn’t disappoint me as much as this particular one. I mean, I know it was my choice to read through, however I genuinely believed you’d have something useful to say. All I hear is a bunch of moaning about something you could fix if you were not too busy looking for attention. I blog often and I really thank you for your information. The article has really peaked my interest. I’m going to book mark your blog and keep checking for new information about once a week. I opted in for your Feed too.